This Military Service Page was created/owned by Diane Short (TWS Chief Admin) to remember Blocker, Dan, Sgt. 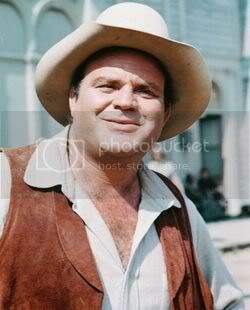 Born in 1928 in De Kalb, Texas to a poor farm family, Dan Blocker was large from the day he was born. At an astonishing fourteen pounds at birth, to this day Dan Blocker remains to be the biggest baby ever born in Bowie County, Texas. Soon after he was born Blocker’s family moved to Lubbock, Texas where Dan’s father became a grocer, and Dan started working at his father’s store at an early age. At age thirteen Dan was enrolled into military school where he excelled as a football linebacker and upon graduation Dan received a football scholarship and entered Sul-Ross Sate College where he studied English. However, fate would turn Dan’s interest away from football when the school’s drama department put on a production of Arsenic and Old Lace. Looking for a student who would be strong enough to move “dead bodies” around the stage, Dan Blocker was talked into taking the part of Teddy Brewster for the production. The experience in front of the audience agreed with Dan, who suddenly changed his major from English to Theatre. Specializing in Shakespeare and American folk drama, Dan eventually graduated with a masters degree in dramatic arts. 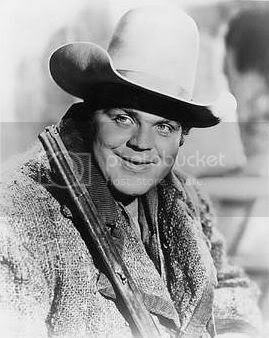 Oddly enough, although his Bonanzacharacter would be the densest of the Cartwright clan, Dan Blocker had a higher education then all of his co-stars! It obviously takes a genius to play a fool. Upon graduation Dan was off to New York City, where he played both King Lear and Othello on Broadway! Imagine Dan Blocker in Shakespearean garb and tights? A far cry from the suede vest and ten gallon hat we are familiar with. However, his acting career would be temporarily cut short when Dan was drafted into the army where he served a short stint in the Korean War. After Korea Dan returned to Texas and began teaching high school English and Drama, as well as married his college sweetheart Dolphia Parker. Upon the birth of their first two children, Dan decided to pursue his PhD in theatre and relocated his new family to Los Angeles. However, while working as a bouncer by night, money quickly became a problem. It was then that Blocker found out that the short lived TV western Sheriff of Cochise was looking for a large man for a guest role. Being perfect for the part, Blocker’s performance on Sheriff of Cochise lead to guest roles on a series of other TV Westerns, includingHave Gun – Will Travel, Maverick,Cheyenne, The Rebel, The Rifleman andWagon Train. Now being able to bring a paycheck in and put food on his table, Dan decided to leave his studies, get himself an agent and pursue television. Preferring television over film, Dan’s film roles were far and in-between during his early period in Hollywood, although a few uncredited roles were won in a number of forgettable films. Continuing in the western vein, Dan played a blacksmith in Black Patch and a bartender inGunsight Ridge. He also played a bartender in a B-grade crime drama calledThe Girl in Black Stockings. However, an appearance in a forgettable Joe Besser short called Hook a Crook lead to his role in a Three Stooges short calledOuter Space Jitters in the role of a prehistoric zombie. Despite the fact that the role was a far cry from the Shakespeare roles he was playing on Broadway, Outer Space Jitters was the first film in which Dan received an onscreen credit. Unfortunately they misspelled his name and he was credited as “Don” Blocker. 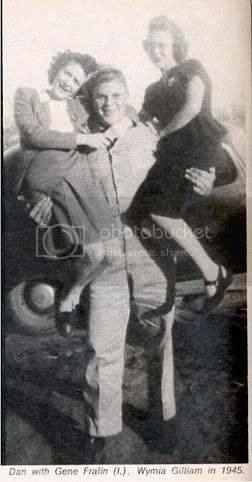 Dan would, thankfully, be able to leave the B movies and Stooges shorts behind and he quickly found fame and fortune in 1959 when he was cast as Eric “Hoss” Cartwright in Bonanza. 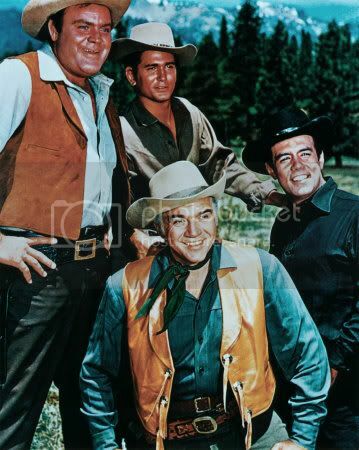 Co-starring Lorne Green, Parnell Roberts and Michael Landon,Bonanza told the weekly drama of Ben Cartwright and his three distinctively different sons, as they tended to the action and drama surrounding their thousand acre ranch, the Ponderosa. Although the show started off slowly in it’s first season, by 1960 Bonanza became a ratings success and a staple for Sunday night viewing for fourteen seasons, making it the second longest running Western in TV history, as well as having the record for holding a position in the neilson ratings top ten the longest – an astonishing twelve years, with only the first and final seasons not making the top ten. The slow but loveable Hoss, who was a champion to loss causes, became a favorite amongst viewers. 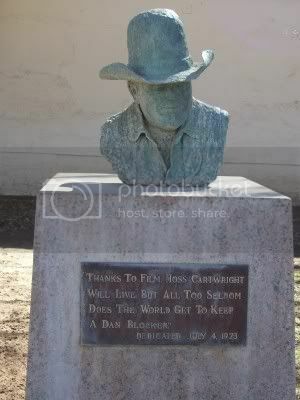 In his distinctive ten gallon hat, Hoss was often the bunt of many of the series’ jokes, but due to his good nature and gentle persona, Dan became the icon of the series. Yet, as often happens quickly with most character actors, Dan had a hard time separating himself from his character. Yet it wasn’t without it’s financial success. In 1963 Dan was one on the groundfoor for the opening of the Ponderosa Steak House, which quickly swept throughout North America. Dan became not only their spokesperson, but would often make appearances in full Hoss Cartwright costume. Unfortunately, he would also be forced to be dressed in Hoss garb for other appearances on The Johnny Cash Show, Laugh-In and as one of the earliest celebrity guests on Sesame Street. The public loved Hoss, but weren’t nearly as interested in Dan Blocker. This was the price Dan had to pay for the popularity of Bonanza. 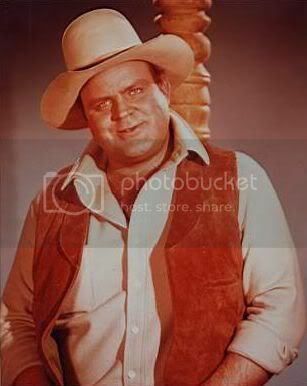 Furthermore as a result of his busy schedule on Bonanza, Dan Blocker was rarely able to participate in any other productions. Yet, he managed to make minor appearances in a few films. He appeared in Come Blow Your Horn and The Lady in Cement, which were both Frank Sinatra vehicles. Dan also gained critical acclaim as the star of his own 1968 TV movie titled Something For the Lonely Man where Dan was finally able to show the TV audience the full range of his acting ability. Typecast as an ostracized blacksmith who falls in love with the town’s schoolteacher when trying to learn to read, a different Dan Blocker was watched by TV audiences. This lead to his own movie Cockeyed Cowboys of Calico County in 1970. However, Cockeyed Cowboys of Calico County was a comedy and unsuited for a dramatic actor of Blockers stature, and as a result was a flop. Dan Blocker was also Stanley Kubrick’s first choice to play Major “King” Kong in his 1964 film Doctor Strangelove. Unfortunately, Blocker’s agent deemed the film to be “too pinko” and instead Slim Picken’s rode the nuclear bomb in the now iconic scene. Dan was also slated to play Major Frank Burns in the big screen version of MASH, but was forced to withdraw from the film when it interfered with moving his family to Switzerland in 1970. A vocal critic against the Viet Nam war, Dan Blocker campaigned for Senator Eugene McCarthey in 1968. Upon McCarthey’s withdrawal Blocker supported Hurbert H. Humphrey for the presidency, but upon his defeat by Richard Nixon, Blocker had had enough pf America’s foreign policies and moved his family to Switzerland in protest. Keeping his home in Inglewood, Blocker spent his time living between Switzerland and Los Angeles for the remainder of his life. Unfortunately, his life wouldn’t last much longer. 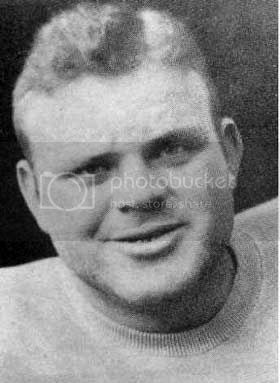 In 1972, during a standard gall bladder operation, Dan Blocker died on the operating table due to a pulmonary embolism. He was 43. Being between seasons, the cast and crew of Bonanza were shocked and left with a problem. What would they do now that their most popular character was dead? You just couldn’t recast a guy like Dan Blocker. There were only two options. They could quietly write Hoss out of the series, which was what was most often done in such situations, or you could kill the character off screen, which was unprecedented. Surprisingly it was decided that they would go for the second option and Michael Landon wrote an episode in which Little Joe had a touching monologue dealing with Hoss’ death. However, in the long run the death of Dan Blocker marked the end of Bonanza. Viewers could not accept a Ponderosa Ranch without Hoss and Bonanza quickly fell in the ratings, and for the first time since 1960 dropped out of the top ten. The cast and crew of Bonanza decided to call it a day, and Bonanza ended in 1973. 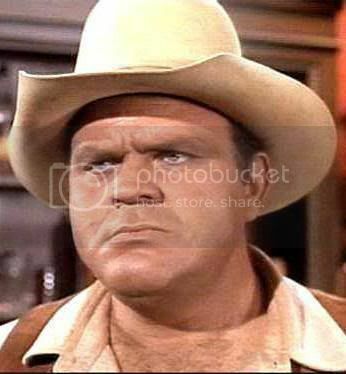 To this day the episodes without Dan Blocker remain to be the least popular and the least reran. Upon his death Dan Blocker was also slated to play Roger Wade in Robert Altman’s production of The Long Goodbye, featuring Elliott Gould in the role of Phillip Marlowe. Due to his death, the role of Wade went to Sterling Hayden but the film was dedicated in Dan Blocker’s honor. Oddly enough, The Long Goodbye would be the first major screen appearance for another giant pop culture icon in an unaccredited role – strongman, action star and future governor of California Arnold Schwarzenegger.